This book offers a complete primer, covering the end-to-end process of forecast production, and bringing together a description of all the relevant aspects together in a single volume; with plenty of explanation of some of the more complex issues and examples of current, state-of-the-art practices. Operational Weather Forecasting covers the whole process of forecast production, from understanding the nature of the forecasting problem, gathering the observational data with which to initialise and verify forecasts, designing and building a model (or models) to advance those initial conditions forwards in time and then interpreting the model output and putting it into a form which is relevant to customers of weather forecasts. Included is the generation of forecasts on the monthly-to-seasonal timescales, often excluded in text-books despite this type of forecasting having been undertaken for several years. This is a rapidly developing field, with a lot of variations in practices between different forecasting centres. Thus the authors have tried to be as generic as possible when describing aspects of numerical model design and formulation. Despite the reliance on NWP, the human forecaster still has a big part to play in producing weather forecasts and this is described, along with the issue of forecast verification – how forecast centres measure their own performance and improve upon it. Advanced undergraduates and postgraduate students will use this book to understand how the theory comes together in the day-to-day applications of weather forecast production. In addition, professional weather forecasting practitioners, professional users of weather forecasts and trainers will all find this new member of the RMetS Advancing Weather and Climate series a valuable tool. 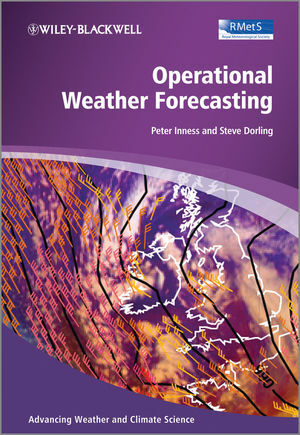 Clearly structured and pitched at an accessible level, the book discusses the practical choices that operational forecasting centres have to make in terms of what numerical models they use and when they are run. Written by a highly respected team of authors with experience in both academia and practice. Peter Inness is a lecturer in the Meteorology Department of Reading University having previously been a Reasearch fellow in the Climate Division of the NERC funded National Centre for Atmospheric Science based at the University of Reading. Steve Dorling is Senior Lecturer and Researcher in the School of Environmental Sciences at the University of East Anglia (UEA). Steve is also Innovations Director at UEA-based Weatherquest Ltd.